This yummy casserole is the perfect comfort food for these bitterly cold winter nights. 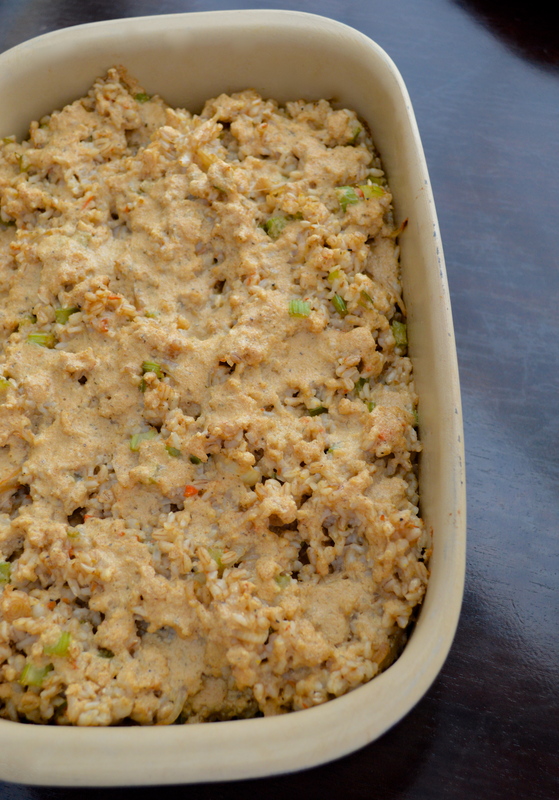 It’s filling + crazy full of flavor but it’s also a healthier option to most casserole dishes. This is vegan + uses the tahini dressing that I posted on a couple springs ago, it makes a TON of food so it’s great to make on a Sunday and enjoy all week long! This recipe comes from The Kind Diet Cookbook, which is full of yummy vegan recipes! Note: You’ll need 3/4 cup of this tahini dressing for this recipe, so make that ahead of time! 1. Preheat oven to 350. Bring 3 cups of water to a boil over high heat in a large sauce pan and add 2 cups hulled barley (you could use pearl if you can’t find hulled). Cook for 60 minutes until tender, drain the water and set aside. 2. Heat 2 tbsp olive oil over medium-high heat in a skillet and then add 1 large white onion that’s been sliced + 3 cloves garlic that’s been minced. Sauté for about 5 minutes until the onion is tender, if it starts to stick or brown too much just add a little bit of water. 3. Add 2 carrots that have been grated (mine weren’t all in the pan yet, there will be more! 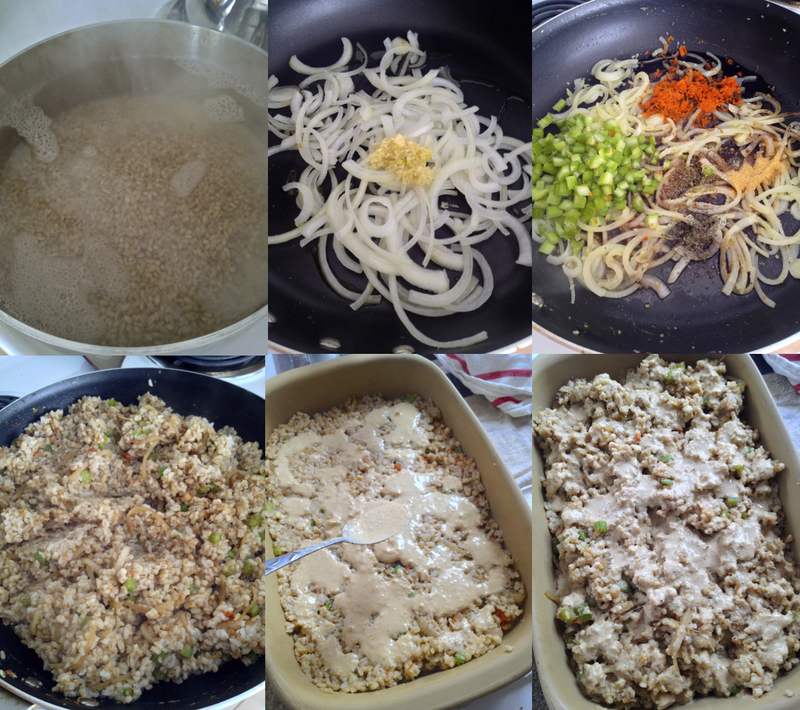 ), 2 stalks celery that has been diced, 5 tbsp shoyu, 1/4 tsp sea salt, 1/4 tsp dried basil, 1/4 tsp dried oregano, 1/4 tsp garlic powder and cook for 5 minutes while stirring occasionally. 4. Add in the cooked barley and stir everything to combine. 5. 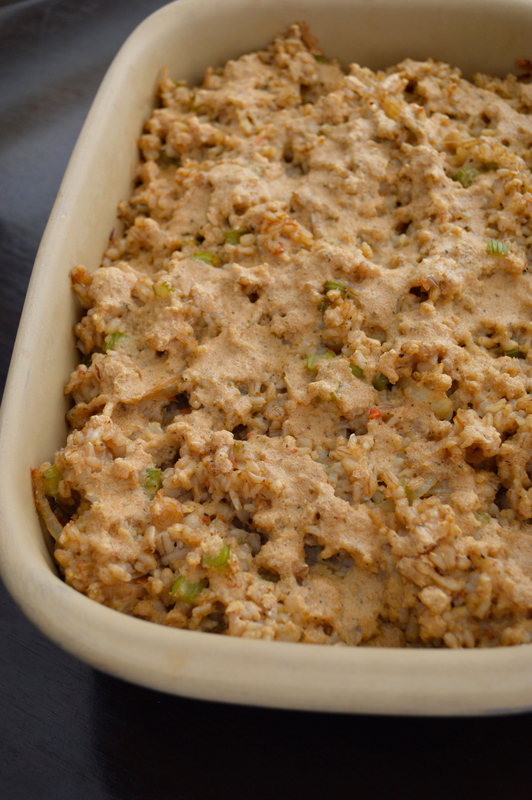 Transfer half of the barley mixture into an 11″ x 13″ baking dish + drizzle half of the 3/4 cup tahini dressing all over the top of that. 6. Layer on the rest of the barley on top of that and drizzle on the rest of the tahini dressing. Bake until heated through, about 35 minutes. If you want to brown the tahini dressing on the top for a little firmer texture and nuttier flavor, place the casserole under the broiler for a few minutes after the 35 minute baking time. Preheat oven to 350. Bring 3 cups of water to a boil over high heat in a large sauce pan and add barley. Cook for 60 minutes until tender, drain the water and set aside. Heat olive oil over medium-high heat in a skillet and then add onion + garlic. Sauté for about 5 minutes until the onion is tender, if it starts to stick or brown too much just add a little bit of water. Add carrots, celery, shoyu, sea salt, dried basil, dried oregano, garlic powder + cook for 5 minutes while stirring occasionally. Add in the cooked barley and stir everything to combine. Transfer half of the barley mixture into an 11″ x 13″ baking dish + drizzle half of the tahini dressing all over the top of that. Layer on the rest of the barley on top of that and drizzle on the rest of the tahini dressing. Bake until heated through, about 35 minutes. If you want to brown the tahini dressing on the top for a little firmer texture and nuttier flavor, place the casserole under the broiler for a few minutes after the 35 minute baking time. If you’re a fan of tahini then you definitely should try it, you’ll love it! Wow this sounds really different and delicious. I’ve never used tahini in a casserole before! It’s definitely a different kind of recipe but it is SO yummy and flavorful!